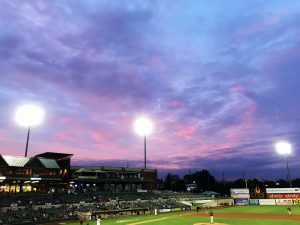 I purchased two seats for a 13-game “mini-plan” for Somerset Patriots games this year, as a sort of experiment. I first went to a Patriots game in 2014, and I’ve been going to more games over the last few years. Only a few games a year, but I’ve enjoyed them. For this year, they offered a 13-game mini-plan that got you some of the benefits of being a season ticket holder, but for just 13 games (for the cost of about 10 single tickets). The games were spread throughout the season. Some were pretty random weekday games, and some were weekend games with fireworks or giveaways. My (overly optimistic) plan was that I’d use one seat myself and give the other to a friend who I know is a big Patriots fan, but who can’t afford tickets that often. What actually happened was that my friend couldn’t make it to most of the games on the plan, so I traded in most of his tickets for other games, and never actually saw him this year. (And I think at least half of his tickets didn’t get used.) As to my own tickets, I only made it to seven or eight games. So I didn’t really come out ahead, financially, versus buying just individual tickets to the games. One of the benefits of the plan was that it included free playoff tickets, if the Patriots made it to the playoffs. They did, and the “Liberty Division Championship Series” was this weekend. The first two games were in Long Island, and the LI Ducks won both of those. Games three through five were here in NJ and the Patriots, of course, would have to win all three. They did win games 3 and 4 (which I missed). I went to game 5 yesterday, but they lost. So their season is over. Thinking back on it, I’m glad I got out to more games this year than usual. I don’t know if I’ll try for that 13-game plan again next year, but I might. It’s weird going to a baseball game alone, but not as weird as I thought it would be. And it’s nice to get out of the apartment and sit outside for a while on a summer day. The games are honestly not that exciting, generally, but it’s a chance to get some fresh air and relax, without thinking too much about work or politics or anything.